Athens was the first city we ever visited in Europe, seven years or so ago, and we loved it. So when we saw an opportunity to go there to do a house sit, we were happy to agree to watch some cats while a couple went out to see a bit of the world. 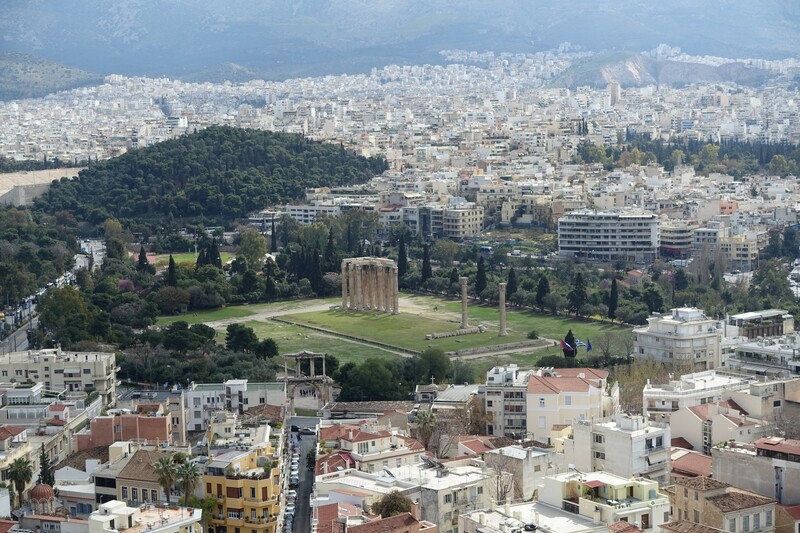 Athens has some of the most mind-blowing sights in the entire world. You just walk along and Boom! A column that’s thousands of years old is just sitting there in front of you. It’s wild. Joe and Ali at the Acropolis. 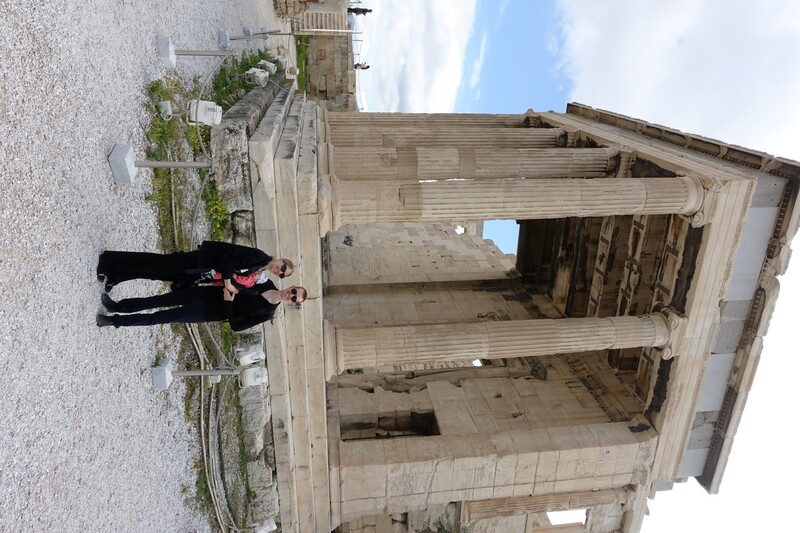 We arrived a few days before our house sit started and stayed at an AirBnB fairly close to the Acropolis so we could walk around that area a bit, since our house sit was in a different part of the city. We wandered around the Agora, hung out in some places where you might have found Socrates chilling a few thousand years ago, and changed diapers next to temple ruins (to clarify: we were the ones changing diapers, not Socrates). You know, normal everyday stuff like that. Confetti left over from the Clean Monday-eve party. We weren’t aware when we planned the trip, but apparently we made it in time for festivities and “Clean Monday.” We got our first inkling that something was going on when we noticed that there seemed to be a lot of children dressed up in Halloween costumes, despite the fact that it was springtime. Princesses, dinosaurs, and Spidermen everywhere. 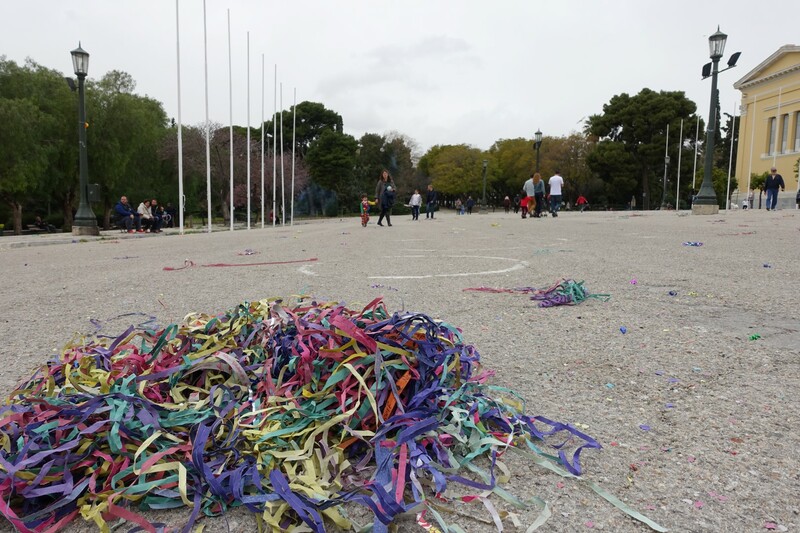 We also discovered that the next day, Clean Monday, involved a bunch of people going out and flying kites. 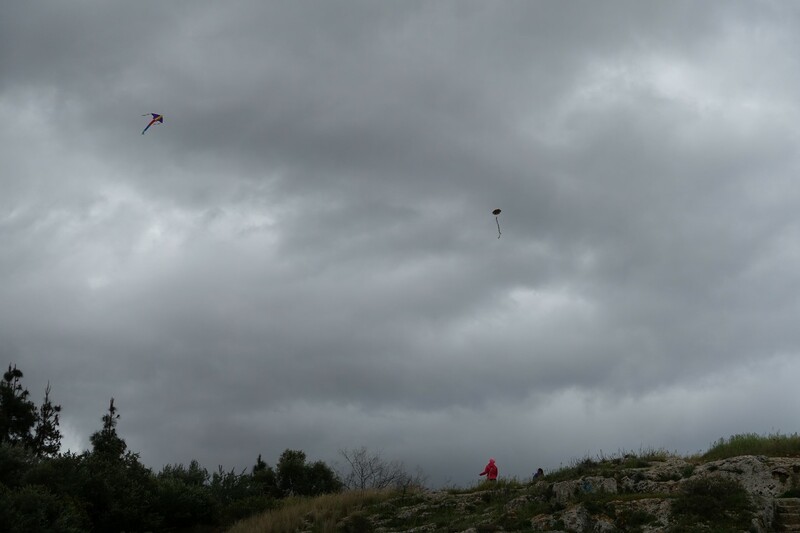 A gloomy day, but… KITES! Joe was immediately stoked. He is a big fan of kites. So the next day, we awoke prepared to go and see some serious kite-flying, only to look out the window and see rain. Definitely a disappointment. Luckily, it cleared up a bit later in the day and we managed to see a few people out flying their kites. Crisis averted! This trip to Athens was our very first house sit (to learn more about what this is, click here), and we were excited. Live like locals! Hang out with some cats! Free apartment! And it was definitely a good experience overall. We got to walk up a nearby mountain and get some great views of the city, hang out at a farmer’s market nearby, and get Annabelle exposure to some cat-hair that will hopefully help her avoid some allergies. There are FIVE cats visible in this picture. And three invisible. Those are the tricky ones to watch out for. However, we also learned a valuable lesson: eight cats is TOO MANY CATS. Basically any annoying thing you can imagine a cat doing, at least one cat was doing at any given moment. And the apartment wasn’t very large, so by the end we felt like we were up to our eyeballs in cats. It was an amusing experience, but man, those animals were a lot of work. 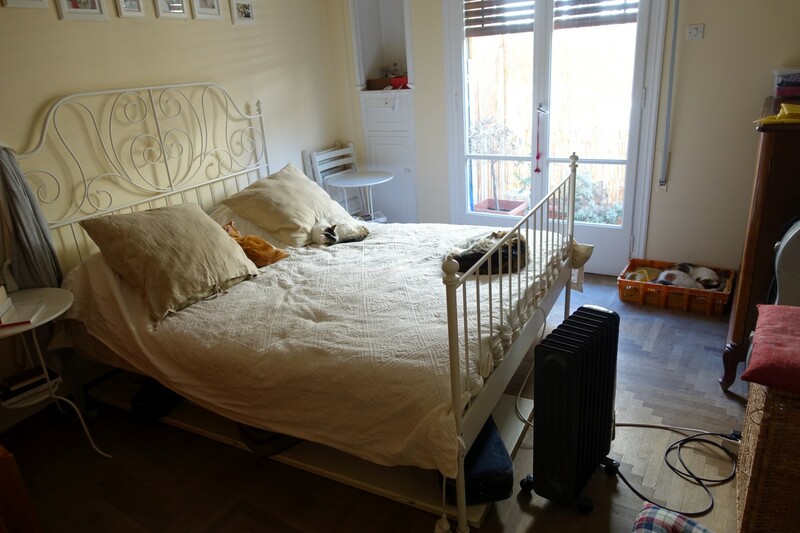 Our house sit was situated about a twenty minute walk from Syntagma Square, a popular large public area with tons of shops and restaurants. “We’ll probably go there once or twice,” we thought. We somehow managed to end up there half a dozen times or more in the two weeks we were in the area. One of those many trips to the square was for a chance to meet up with a Mustachian couple who were doing some slow-traveling of their own. We had a nice long lunch hanging out with them and learning about how they’d retired early and the travels they’d been on. It was fun to meet slightly different versions of ourselves. 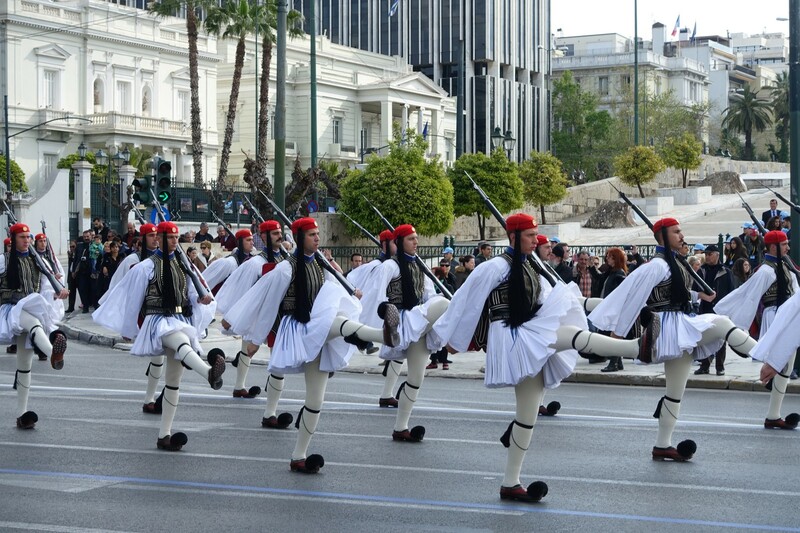 We also discovered that we would be in town for Greek Independence Day, and that there was going to be a parade around Syntagma Square to celebrate. Joe: It’s not going to be fun. Ali: What do you mean? It’s going to be great! We have to see the parade! Joe: Remember Bastille Day? European parades aren’t full of floats and balloons and people throwing candy. They have military people marching down the street. Ali: Maybe that was just France! We should go! So we clipped Annabelle into the Baby Bjorn and walked down to see the parade. After walking past a cannon that was being shot off so loudly that car alarms went off around us (don’t worry, Annabelle slept through it), we made it to the square, where we stood for a while waiting for the parade. You could load those barrels with candy! What could go wrong? Once it had been going for a bit and I’d been convinced that yes, it was in fact military people marching and no candy-throwers in sight, it began to rain and we headed back to our apartment. It was fun to see all the people out to celebrate their independence, but Europe really needs to get their act together where parades are concerned. At least they managed a couple of jet and helicopter flyovers (Annabelle slept through those, too). When the two weeks were up, the cat owners came back, and we were happy to relinquish all cat-related tasks. It had been fun, but it was time to go. We gathered our stuff (and a couple extra lint rollers), and headed off to Prague. 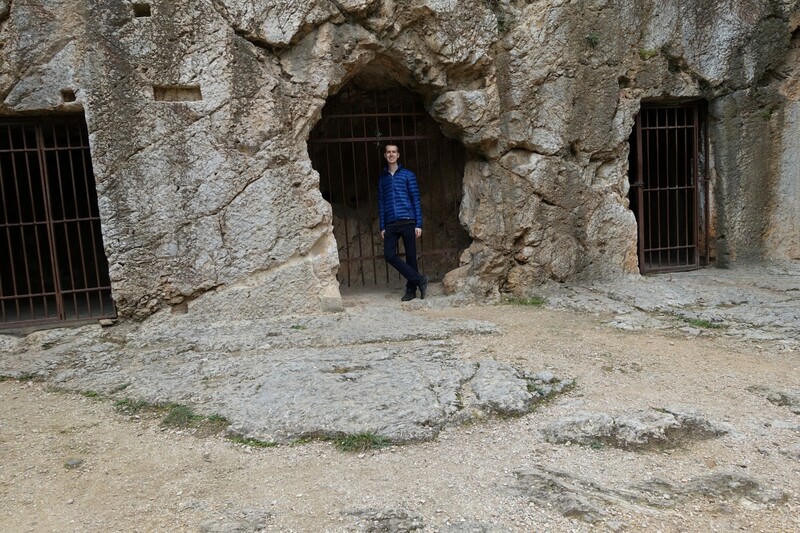 Joe hangs out outside the jail that supposedly held Socrates before his famous trial.